Have you ever felt lost or directionless? This feeling can come from many places. Maybe the current abuse scandal in the Church has you reeling. Many college students feel lost when trying to pick a major. Some people just cannot see where they fit in the world, cannot find a purpose or direction. When you are young and single and all your friends are getting married but you have not had a date in a year, you can feel lost. Young parents trying to navigate diapers, bath times, temper tantrums, and thrown food dishes can wonder when life got off track. Even empty nesters can often feel directionless as the daily routine shifts from raising children to reconnecting with the love of their life. In addition to this, journeying through transitions of loss and grief, or the end of a relationship or job can often leave a person feeling aimless. Something I heard in a homily recently really shed some light on this idea of being lost and directionless. The priest said God does not give us a map with turn-by-turn directions for our life. Rather, he gives us a compass and the needle of the compass points to the sacraments. He went on to say that when we stay close to the sacraments we stay close to Jesus and God, who is a loving Father. 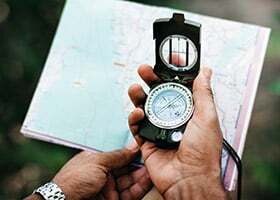 I really like the image of God giving us a compass instead of a GPS enabled turn-by-turn navigation system. Sure, it would be easier to live day-to-day with every step outlined, but there is something about the idea that God points me in a particular direction and invites my free will to cooperate with His Divine Will. There is no coercion or mindless following; instead, there is a relationship. The relationship begins with Baptism, where we are pointed in the direction of heaven through the washing of our sins and becoming a part of God’s family. The relationship continues with Reconciliation where we are reconciled to God and Body of Christ. The Eucharist nourishes this relationship with real food, real flesh and blood, and true God. Confirmation strengthens and fortifies this relationship with the power of the Holy Spirit. The sacraments of service, Matrimony and Holy Orders, give our life the primary way we will serve God and the community, all while sharpening our soul on the journey to heaven. Lastly the Anointing of the Sick brings us the healing power of God and the provisions needed to pass from earthly life to eternity. 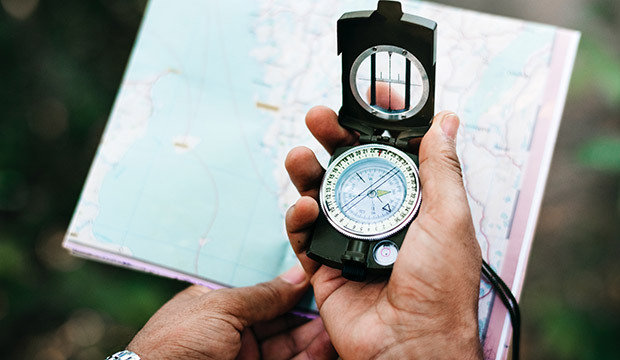 Navigating by compass means we have to pay attention to our surroundings, read the signs around us, and stay focused on where the arrow is pointing. Finding our way out of a time of feeling lost is very much like this. When we are directionless we can look at our surroundings and assess if they are they helping us move forward or holding us back. These surroundings can include our friend groups and other people in our life. It can also encompass the way we spend our time. Maybe we are spending too much time on social media or not enough time hanging out with our friends. It is good to ask ourselves if the people we are with and the things we are doing lift us up or pull us down. Put another way, do they help point us in the same direction our compass is pointing? What makes following a compass so hard is that often we feel like we are trying our best to stay the course. We are going to Mass and receiving the sacraments but we still feel lost. But as I mentioned before, God has invited us into a relationship, not a transaction. It is not as if two extra Masses plus one confession equals one message from God. The relationship with God is not a means to an end, it is the end. The goal of life is deeper and deeper relationship with Jesus. When we achieve this, even a little bit, no matter how lost we are, we are always right at home. Jeff Hedglen is the director of campus ministry at University of Texas at Arlington. Have you ever felt lost or directionless? This feeling can come from many places. Maybe the current abuse scandal in the Church has you reeling. Many college students feel lost when trying to pick a major. Some people just cannot see where they fit in the world, cannot find a purpose or direction.